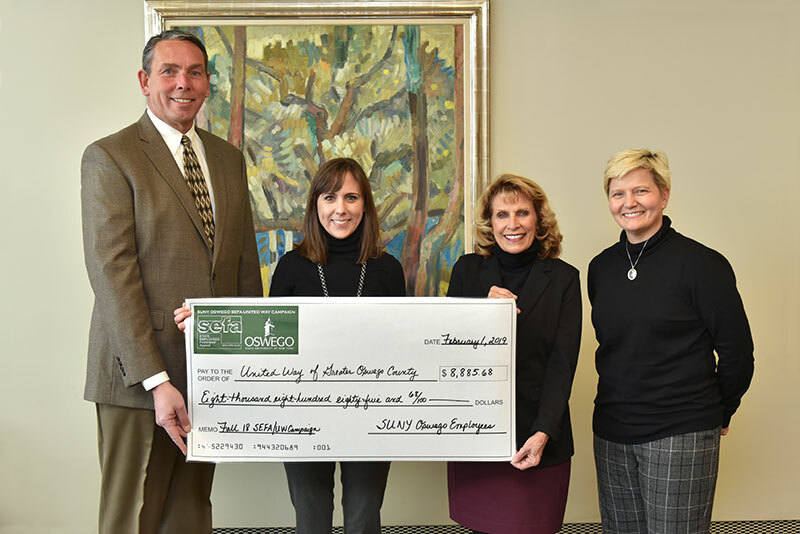 College President Deborah F. Stanley (second from right) and her executive assistant, Mary Toale (right), present the State Employees Federated Appeal check for $8,885.68 on Feb. 21 to Patrick Dewine and Lexie Wallace, executive director and resource development director, respectively, of United Way of Oswego County. 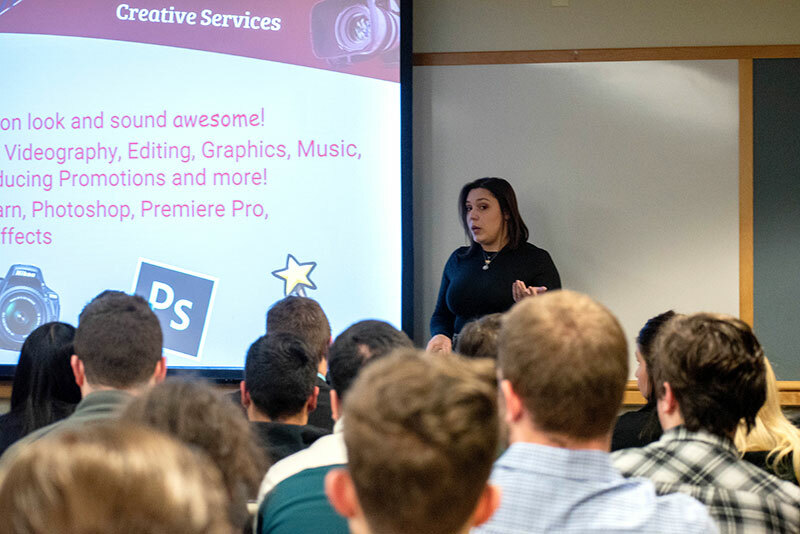 Employees across campus who wrote checks or pledged via payroll deduction -- and members of the public participating in numerous fundraising events -- donated a total of $26,596.18 in the 2018-19 SEFA United Way campaign. Donors were able to select recipient charitable organizations, not just United Way, from thousands worldwide listed in SEFA’s annual handbook of giving. 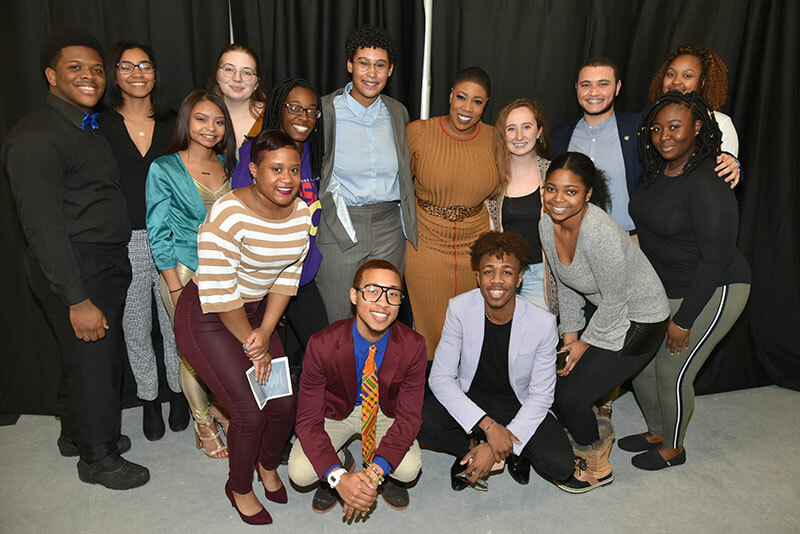 Prior to the annual Martin Luther King Jr. Celebration, program participants and others take advantage of a meet-and-greet with Symone Sanders (center in tan dress), CNN political commentator and keynote speaker for the Jan. 30 event. 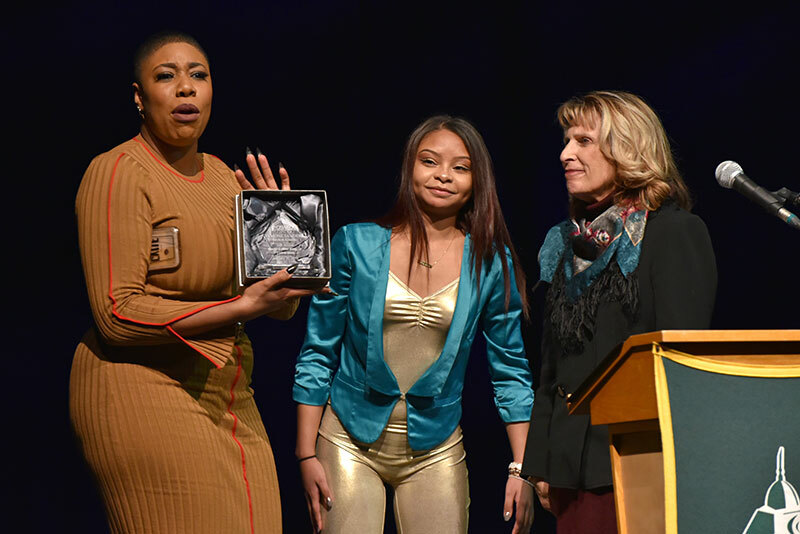 The Martin Luther King Jr. Celebration’s keynote speaker Symone Sanders (left) expresses appreciation Jan. 30 for a gift presented to her by college President Deborah F. Stanley (right), while the celebration’s emcee, junior English major Natasia Burgess, looks on. Sanders told Waterman Theatre audience members that they, too, can be activists in making community change happen if they are willing “to do things differently and take a risk.” Sanders, a CNN commentator and self-described activist for social change, served as national press secretary for Vermont Democrat Bernie Sanders’ 2016 presidential campaign. 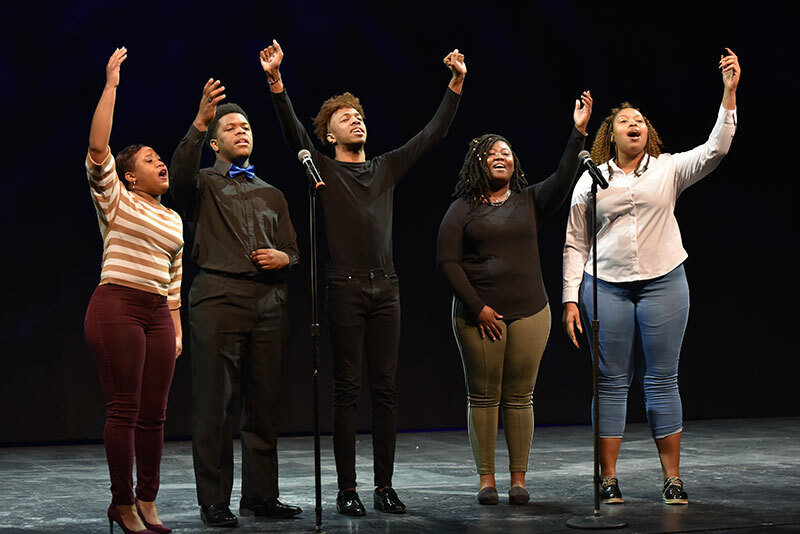 The college’s Gospel Choir -- in one of the several musical performances Jan. 30 during the Martin Luther King Jr. Celebration in Waterman Theatre -- sings “Total Praise.” The evening also featured theatre faculty member Mya Brown’s recitation of King’s famous “I Have a Dream” speech. 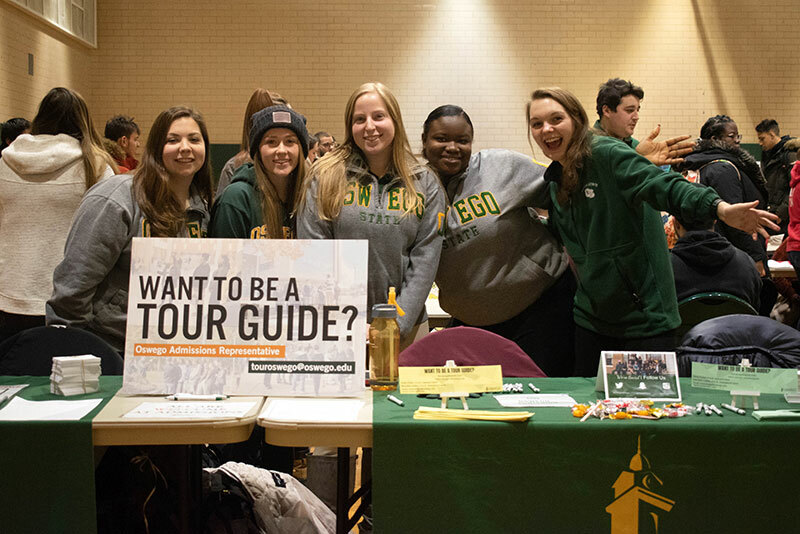 A SUNY Oswego student tradition since at least the early 1960s, Miss-a-Meal -- students skipping a meal each semester and donating what they would have spent -- raises thousands of dollars for a charity, including $4,030.90 for Oswego County Opportunities/Services to Aid Families, thanks to the Nov. 29 event. 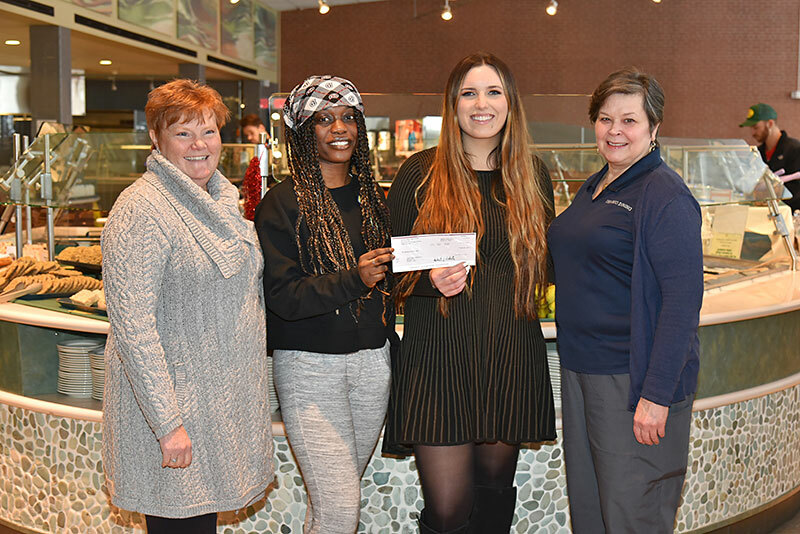 From left are Ruth Stevens, director of resident dining; Denise A. Boadi, Student Association senator-at-large; Isabella Winklestine, advocate-educator at the college’s Mary Walker Health Center for OCO/SAF; and Donna Shumskis, Lakeside Dining Hall cashier. 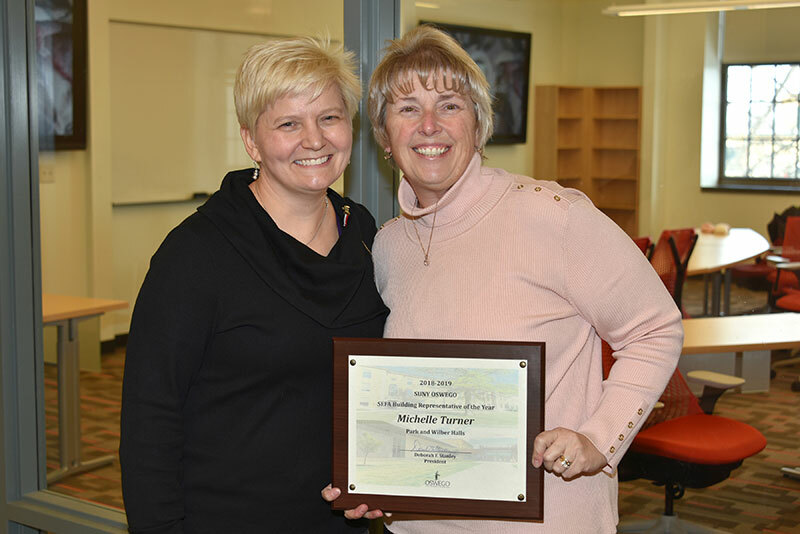 Michelle Turner (right) of Park and Wilber halls accepts the annual SEFA Building Representative of the Year Award from Mary Toale, who convened the 2018-19 State Employees Federated Appeal Committee as executive assistant to college President Deborah F. Stanley. Stephanie Lamb (left) and Darlene Tynan (right) share the award on behalf of King Hall and Rich Hall, respectively, for the most popular baskets donated to the SEFA Baskets of Caring event. 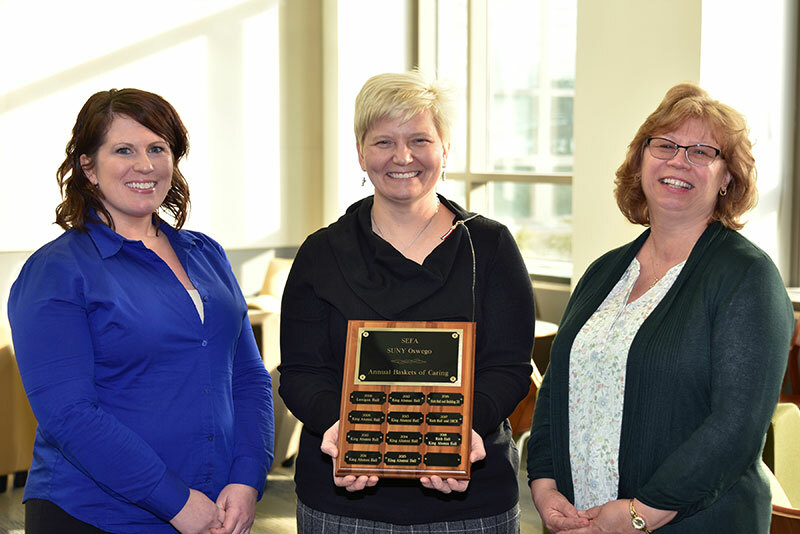 Mary Toale (center), who convened the 2018-19 State Employee Federated Appeal Committee as executive assistant to college President Deborah F. Stanley, presents the plaque. A popular two-day fundraiser for many years supporting the SEFA United Way campaign, Baskets of Caring raised $4,365. Sara Cruise (front right) prepares to pass to fellow freshman forward Skylar Byrne, as they assist on the eventual game-winner by yet another freshman forward, Annika Neufeld-Kreider. 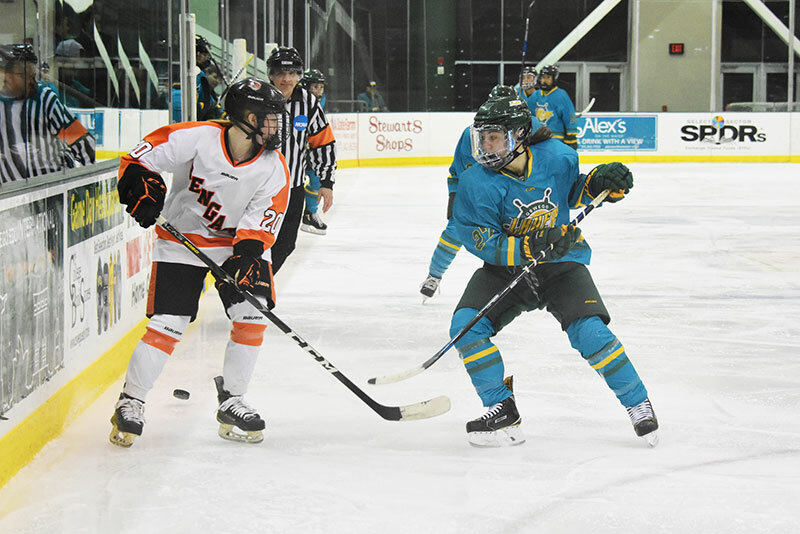 The Lakers wore teal jerseys, to raise awareness of ovarian cancer, in their 2-0 defeat of Buffalo State on Saturday afternoon at Marano Campus Center. The Lakers moved to 9-7-3 overall (4-6-2 in the Northeastern Women’s Hockey League) on the strength of junior goaltender Rachel Farmer’s 27-save shutout. Oswego is set to travel to Cortland today for a 7 p.m. league game. Lakers junior forward Joseph Molinaro seizes control of the puck moments before tallying the first of his two goals -- this on a backhand shot from behind Buffalo State’s goal -- in third-ranked Oswego’s high-intensity annual Teal Gate game at Marano Campus Center. The Bengals jumped out to an early lead, held off the Lakers, 6-5, and moved Oswego to 16-4-1 overall (9-3-0 in the SUNY Athletic Conference). The Lakers donned teal jerseys Feb. 2 in support of ovarian cancer awareness and research. 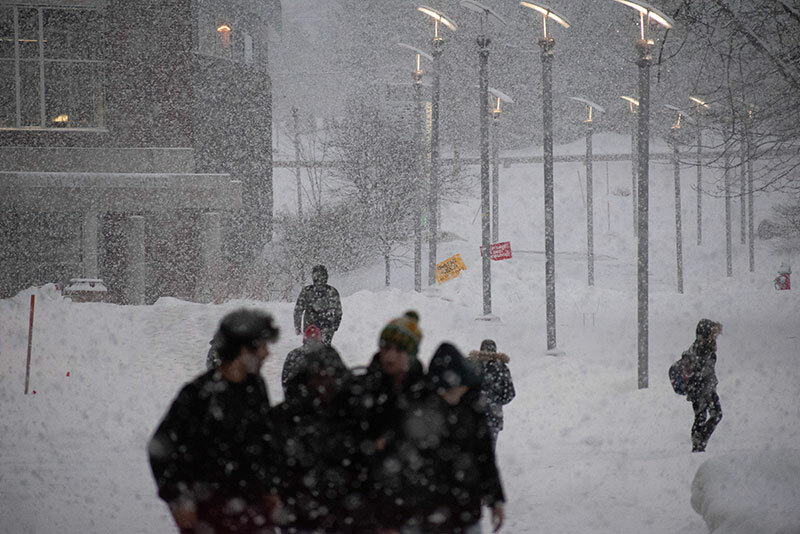 Oswego returns to action for a road contest at Brockport at 7 p.m. Friday, Feb. 8. 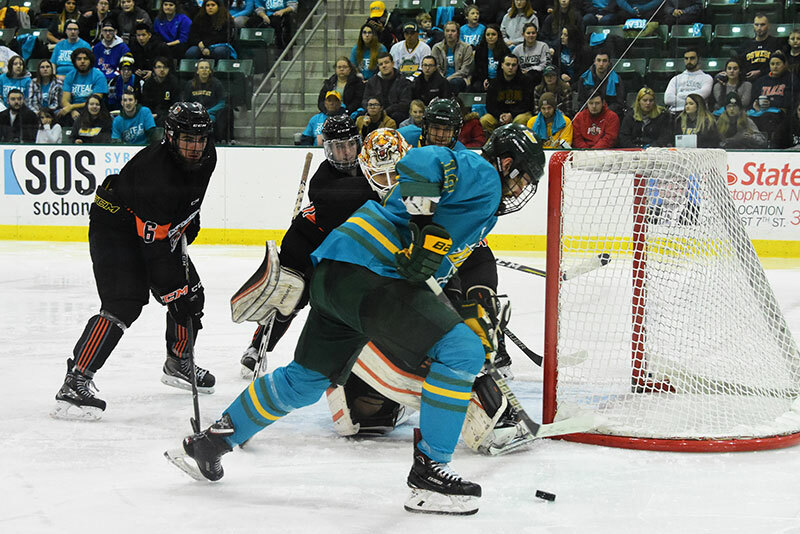 The teal tradition comes from the late Mary Gosek -- a longtime SUNY Oswego employee and wife of men’s hockey coach Ed Gosek -- who raised a sizable amount of awareness about ovarian cancer before succumbing to the disease in 2017.